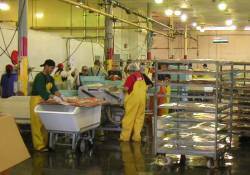 Area 5 lays claim to Bristol Bay, one of the must lucrative salmon fisheries in Alaska. There are more red salmon harvested in Bristol Bay than in any other Alaskan fishery and sockeye salmon percentages in Bristol Bay account for nearly 19% of all salmon caught in Alaska. Gillnetting is the popular method of fishing out of Bristol Bay with deckhands averaging salaries ranging from $7,000 – $15,000. And this is for a season that begins in the end of June and only lasts until the last week of July. While the pay is legendary and the salmon fishery immense in Bristol Bay, it is perhaps one of Alaska’s most remote locations. Residing in the north, the region is considered ‘remote’ even for Alaskans. Accessing the region is difficult and expensive and the job market is not good for newcomers. Every once and a while a new comer will find success in procuring a job in Bristol Bay although, it is very unlikely. With a region so rich in salmon and so popular among veterans in the industry, as a first timer you will be ultimately more successful procuring work in Areas 1, 2 or 3 on your first run out. The cities that reside in Area 5 are commonly considered: Bethel, Togiak, Dillingham, Naknek and Egegik.